Pack up the pumpkins and break out the tinsel – it’s November 1st, and that means holiday coverage is officially happening here on the Canadian Gift Guide. For the next 50 days, I am going to be sharing some of the most creative, versatile, exciting, wish-worthy gift ideas I could find, kicking off with today’s prowl through the racks of Joe Fresh. Honestly, I’ve been scooping up holiday goodies from Joe Fresh for my girl friends, husband, sister and friends’ kids for years. Their affordable price point, always on-trend styles and wide availability make them a great fit whether you’re hunting at the start of the season or well into the final days before Christmas Eve. With that in mind, I’ve rounded up picks from this year’s line-up for everyone on your shopping list. The easiest way to a stress-free holiday shop is right here! Every woman deserves a little cashmere in her life – at least that’s the message my sister instilled in me from a young age when she got her first cashmere sweater. This season, Joe Fresh is dipping into plenty of luxe fabrics, including cashmere, silk, and mohair. The ultra-touchable cashmere collection is full of plush cardigans, gloves, and scarves, but it’s the simplicity of this classic crew neck sweater that won me over. Available in 10 different shades – from on-trend neutrals like camel to seasonally appropriate shades of icy blue and winter white to the brand’s signature hot orange – this is a perfectly priced luxury gift for your wife, daughter, sister, mom, or any lady in your life that deserves to feel warm and snuggly all season long. This year Joe Fresh has launched a new, limited edition line of ultra cozy winterwear that’s not just about fashion, but function. Designed to stand up to Canada’s harshest winter weather, both the men’s and women’s collections are graced with chic, made-in-Canada coats with luxe finishes like faux fur trim, down filling, and the brand’s signature bright orange shade adding a warm cheery pop during our otherwise dreary winters. 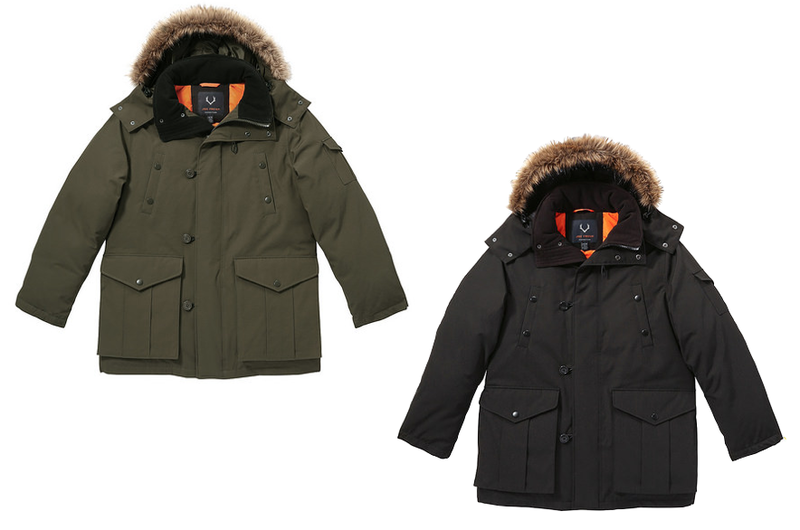 Bonus points on these men’s coats for oversized pockets that are mitten-friendly, windproof storm plackets, and a detachable hood for when it’s not quite as frosty out. If your dad / brother / son / husband is in need of a new winter jacket, look no further – these rugged-yet-suave coats perfectly blend style with utility. Check out the other Fresh Expedition men’s coat here, and the two women’s coats here and here. I have a friend who is very much not a kid that very much shops in Joe Fresh’s kids department. I have to say that I’ve never been more jealous of her than I am in looking at their super chic yet ultra cute line-up of winter booties. I’ve picked out four of my faves, but there are plenty more to choose from. The great thing about nabbing a pair of these beauties is they’ll actually make your sullen tween feel okay about stepping foot into the crispy snow. With fun details like pom poms, super trendy southwestern prints, rockin’ studs, and of faux fur – a resounding theme in this round-up – you’ll be hard-pressed to pick just one….or two…or three pairs. Did I mention you’d still be spending under $100 if you bought three? Yeah. Amazing. When Joe Fresh Beauty launched, it immediately won over beauty editors and bloggers for its amazing quality compared to its bargain prices. The trend continues as new products – and amazing gift sets like this one – continue to attract beauty mavens and beginners alike. Obviously the big standout feature here is the price; since most Secret Santa swaps (whether at work or amongst a group of friends) have a $10 or less limit, both the beautiful orange wrapping and the fact you get five highly pigmented eyeliners means you’re getting a lot of bang of your buck. If it’s a Yankee Swap, don’t be surprised if this beauty is snapped up a few times! 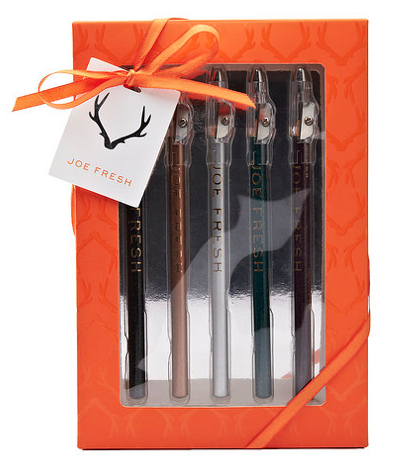 As a heads up, Joe Fresh Beauty is only available in stores – check your local Loblaws / Real Canadian Superstore / Joe Fresh for the full line, including tons more cute, holiday season ideas. 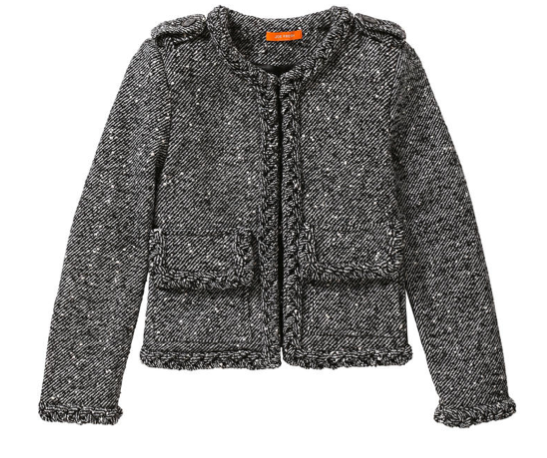 This shimmery tweed jacket proves that holiday wear doesn’t need to be overly flashy. With a Chanel-inspired feel, this luxe blazer is an excellent length on women of any age, and manages to lose any trappings of fussiness thanks to its fun braided details and seasonally appropriate hint of sparkle. While I singled it out as an apropos gift for any chic mom, it’s equally well-suited to a girl in her 20s that’s just building an adult wardrobe. It pairs beautifully with a LBD, or dresses up a perfectly fitted pair of jeans and a simple white top. Call it an investment piece, a wardrobe staple, or that jacket you reach for that goes with everything – this is one idea that should be on a million wish lists. 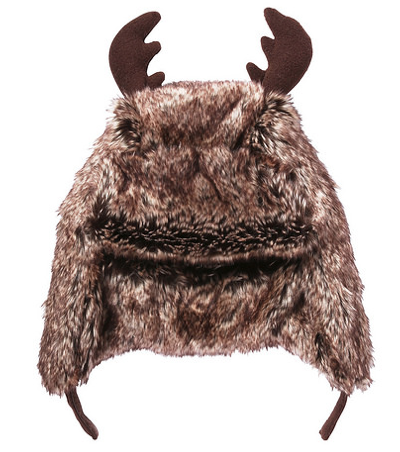 Technically this super cozy little hat is under the boys’ department, but I honestly think it’ll work for any adventurous child that enjoys a little whimsy. Rendered in on-trend faux fur (you’ll see flashes of it throughout this post) with a Rudolph-esque set of antlers on top, it’s the perfect winter accessory for any budding style aficionado that doesn’t mind making a statement when they step out. As a bonus for parents, it’s a stocking stuffer that actually serves a purpose – keeping your little ones’ head warm when they’re building that snow fort. If I didn’t have a holiday season’s worth of posts lined up, I would have written a Trend Watch post on the impact quilting is having on fashion this season. No longer relegated to puffy winter coats, it’s showing up everywhere – from pretty puffy flats to chic handbags to cozy sweaters like these two. Generally when I write gift guides for gal pals, I stick to the $50 or less mark – and these sweaters fit the bill. Not only do they feature the quilting trend, they’re the type of piece I could see virtually any of my friends wearing – from the new moms looking for something they can move in to my grown-up tomboy chic friend that would offset it with a pretty sparkly necklace to anyone that knows me and my current obsession with quilted anything (thank you fashion industry). Dress it up, dress it down – this one’s a winner. With the current baby boom as of late, I imagine that more than a few of you will be shopping for infants and toddlers this holiday season. Joe Fresh is an amazing source for kids wear, in part because the affordable price point and adorable style makes it easy to splurge on super cute things, even if you know the little one will grow out of it in a couple of months. That being said, this ultra plush hodded robe has legs – or at least, antlers. 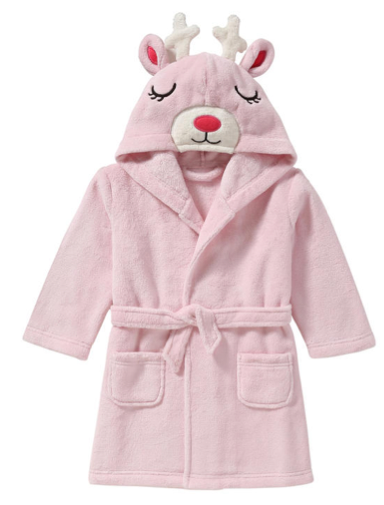 Buy it a size or two larger than the toddler you’re shopping for needs; a robe doesn’t need to fit perfectly and will still be plenty functional a year or two down the road. 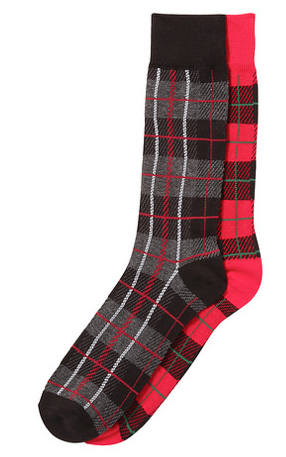 I adore the festive plaid print on these ultra-snuggly socks; Joe Fresh is usually where I pop by to stuff my husband’s stocking with loads of must-haves like fun-printed socks or boxers. These are great because they have the clean cut of a dress sock and offer a fun splash of print when revealed under a trouser leg, but they’re also equally wonderful for padding around the house. They even work as a Secret Santa buy if you’re stuck with a $10 or under limit. Trend Watch alert! I’ve done a lot of shopping and browsing in prep for this season’s gift guide, and one consistent look on the racks right now is the faux fur vest. I particularly enjoy the hip length cut and unique stripey pattern of this option from Joe Fresh; it reminds me of an exotic owl as opposed to any fur-bearing creature. 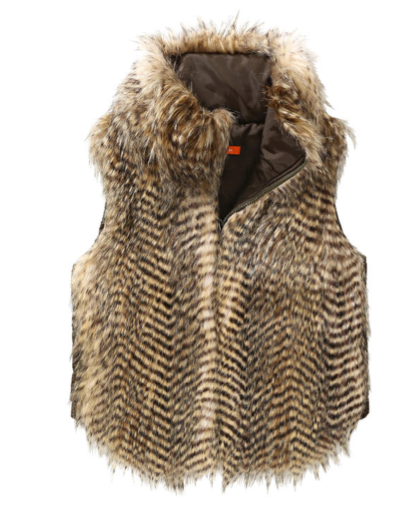 It also earns props for not coming across as too bulky – one of the deadly sins of many of the faux fur vests I slipped on this fall. Anyway, with a great price, this super of-the-moment item is great for when your sister is heading to the mall and doesn’t want to lug around a big parka, or to layer over a turtleneck and leggings for a chic faux apres-ski look for brunch or a night at the movies. For Your Nephew: Toddler Boys Animal Sweaters – $16So half of my motivation for having children one day is so I can dress them up in super cute, ridiculously adorable clothing like these precious sweaters. Space dye – the effect that gives these two snuggly sweaters that two-toned shading – is a surprisingly popular trend this winter, and works equally well for boys and girls (and their adult counterparts). I have a few friend with little boys in their lives and I usually buy them sweaters at Christmas – consider this one on my shopping list (and yours too, I’ll bet). As a heads up, they’re also available in different colours and prints for infants! I’ve said it before and I’ll say it again – winter can wreak serious havoc on even the most diligent skincare taskmaster’s face. 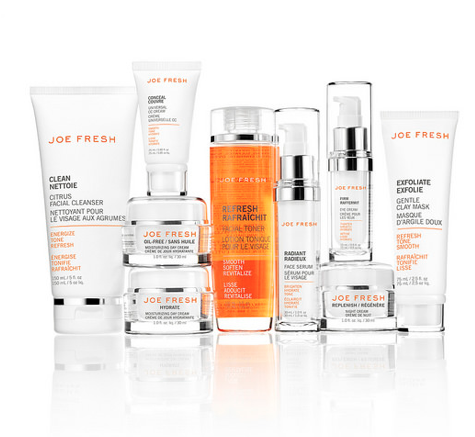 The good news is, Joe Fresh has recently launched a new collection of skincare products designed to slough off dry, flaky skin and moisturize what’s beneath for a radiant, healthy glow from New Year’s Eve and beyond. The price points are perfect for stocking stuffers too – if you have someone in your family that’s curious to give the brand a whirl, pick up an item or two and watch them (and their skin) fall in love. These are truly just a handful of the gift ideas available at Joe Fresh this 2014 holiday season. If you want to find out for yourself, then I’ve got a mission for you. The stakes? You could win a $200 gift card from Joe Fresh plus an additional $100 prize package of goodies from the brand. The way to win it? Read on. 1) Your aforementioned mission is as follows. Visit the Joe Fresh website and scour it for your most favourite gift idea for a loved one or for an item to add to your own wish list. Leave a link back to that item in a comment below. Boom, you’re entered to win! You’ve got till midnight on November 30 to get browsing. 2) Entries are limited to one per person / per email address / per household (or more if you score bonus entries). A random draw will be conducted on or around December 1, 2014 to select the winner(s), who will have 48 hours to respond before another winner is chosen in their place. 4) Bonus Entries: Joe Fresh is super active on social media. If you are too, you’ve got FOUR ways to earn extra entries into the draw. For whatever activities you do, be sure to leave a separate comment below, otherwise your entries won’t be counted! Follow Joe Fresh on Pinterest and repin one of the gift ideas featured in this post. Link back to your Pin in a comment below. Follow Joe Fresh on Instagram and like or comment on one of their photos. Link back to said photo in a comment below. This is just the start of a beautiful holiday season here on the Canadian Gift Guide – and tons of amazing giveaways too. If you want to stay in the loop, make sure you subscribe by entering your email in the ‘Gift of Gab!’ box in the upper righthand column of this post. And be sure to keep an eye on my Winners Circle page for the latest and greatest giveways! https://www.joefresh.com/ca/Categories/Women/Shirts-Tops-Silk/Silk-Shirt/p/WF4W220037_404 I love this colour, and I think the shirt is a timeless piece you could wear anywhere. Love the fur and pompoms on the boots! 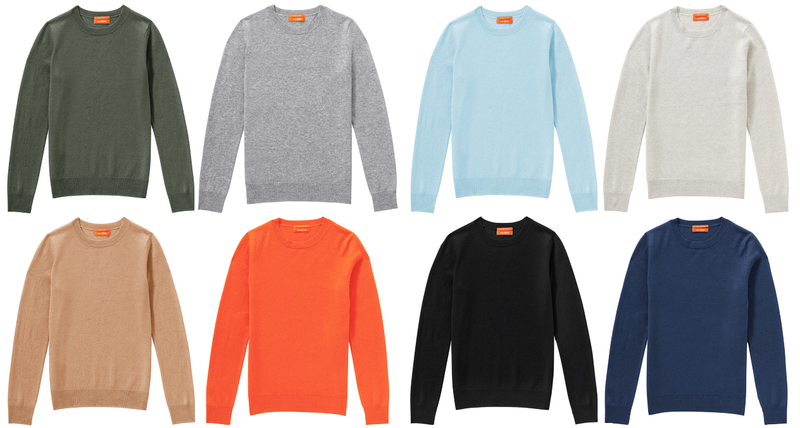 And love the cashmere sweater colour options! My best friend would love this Slouchy Cashmere Sweater in Light Brown. I like the Toddler Girls’ 2 Piece Snowsuit in Pink. It would look great on my granddaughter! cashmere crew neck sweaters look fabulous for gifts. I’d like this for my own wish list! Thank you Canadiangiftguide.com for the great giveaways you always have, Cheers !! I’d love to get the Print Knife Pleat Dress https://www.joefresh.com/ca/Categories/Women/Dresses/Print-Knife-Pleat-Dress/p/WF4D315047_606 for myself to wear at my Christmas party. just incase it doesn’t show up, it is the link to my Facebook post. I really love Joe Fresh clothing. The line features fashionable clothing of good quality at an a affordable price. I have many pieces already in my wardrobe. I would love to add the Joe Fresh light blue cashmere cardigan. https://www.joefresh.com/ca/Categories/Women/Sweaters/Cashmere-Cardigan/p/WF4R360003_405. It is gorgeous! I liked Joe Fresh on FB and commented https://www.facebook.com/joefresh/posts/10153020742752580. I followed Joe Fresh on Instagram as jasmyth10 and liked this picture and commented http://instagram.com/p/uvg6FzKznP/?modal=true. I really like this: https://www.joefresh.com/ca/Categories/Women/Knits-Tees/Ribbed-Knit-Tee/p/WF4K190200_306 I love the colour of it, and it looks nice and warm for these cooler months ahead. I left Joe Fresh a facebook comment. I am a toggle lover. I’d like to get this sweater for my 2-year old son. I like this sweater for my grandson! https://www.joefresh.com/ca/Categories/Women/Dresses/Polka-Dot-Dress/p/WF4D310075_001 This is so cute! Would love to own it! I have liked Joe Fresh on FB! love this Joe Fresh toddler rain jacket! This hoodie looks so comfy! I love this puffer jacket, so cute and it’ll keep me warm n cozy too!! I love the Boy’s Shawl Collar Sweatshirt. I MUST add the DUFFLE PARKA to my own wishlist! I like Joe on Facebook! I like Joe Fresh on Facebook. I follow Joe Fresh on Twitter. I follow Joe Fresh on Pinterest. I follow Joe Fresh on Instagram. Love the braided tweed jacket. Joe Fresh clothing is great value. An item for my wish list would be the Dark Denim Jacket. I am ridiculously in love with this duffle coat: https://www.joefresh.com/ca/Categories/Women/Outerwear/Duffle-Coat/p/WF4O100037_001. I need a new coat and I think that may just be it! I’d love this shirt for my son. 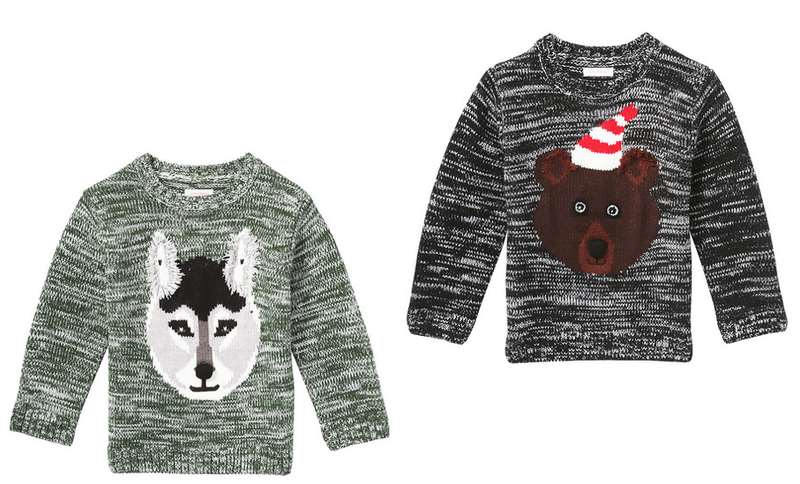 We call my son “bear” – this sweater is the perfect Christmas Eve top! Re: OMG, I luv https://www.joefresh.com/ca/Categories/Women/Sweaters/Graphic-Sweater/p/WF4R330314_212. To die for. Pick me, pick me! Your next winner!!! Show me the money!!! It would be a dream come true and means more to me than anyone else to win. 😦 Starving artist here desperately needs the $300 Joe fresh gc to shop, wear new clothes, have fun and feel alive and inspired again. A life changing experience. Top of my bucket list. Thank you for the awesomeness, the contest, and generosity. Dear Santa: I’ve been nice. My X-Mas wish this year is to win this contest. the baby pattern knit baby set is adorable, I would love to dress my 3 year old daughter with Joe Fresh clothing! My favourite item for ME is the BOXY JACKET https://www.joefresh.com/ca/Categories/Women/Blazers/Boxy-Jacket/p/WF4J125023_001 and my favourite item for gifting is the SLOUCHY RIB KNIT HAT https://www.joefresh.com/ca/Categories/Women/Accessories/Slouchy-Rib-Knit-Hat/p/WF4C490218_103 I have a girlfriend who would love it! Pinned my favourite gift idea from this post! my daughter would love this as a gift – sequin dress! This would be a great christmas onsie for my baby that’s due any day now! Who doesn’t love a comfy sweater??? I’m Susan Terendy on FB. I think it would be a good gift, because it’s so warm and cozy for winter. I love the girl’s boots, all very nice. For my man, I’d love to see him in https://www.joefresh.com/ca/Categories/Men/Outerwear-Jackets-Blazers/Men%E2%80%99s-Raw-Edge-Blazer/p/MF4O125009_407. I would add https://www.joefresh.com/ca/Categories/Women/Sweaters/Colour-Block-Turtleneck/p/WF4R330354_214 on my wish list. I would like a pink cashmere sweater for my sister. I love the braided tweed jacket! I am loving these boots! This is a great sweater! A classic for anyone. My daughter would love the toddler boys animal sweatshirts! Love this whole outfit, but I would settle for just the sweater! I’m loving the Duffle Parka! Looks so cozy! Love the men’s Varsity Jacket. Takes me back to my days as starting QB in college. Wait, I never had those days… but the jacket will let me pretend I did! This reminds me, I need to pick it up! Thanks for the chance to win! https://twitter.com/HappyGlowLucky7/status/533897538508574721 I follow them on Twitter. http://instagram.com/p/uvg6FzKznP/?modal=true Liked this photo (happyglowlucky is my Instagram name), and follow them on Instagram. Liked Joe Fresh on facebook! Pinned it on Pininterest, not sure how to attach link. Here’s the link to my PinInterest following and post! I like this blouse to dress up an outfit for work (and the mauve colour is so nice). I would love to be able to get these boots. https://www.joefresh.com/ca/Categories/Women/Accessories/Long-Faux-Fur-Scarf/p/WF4C490212_212 I would love to get this scarf and it is also a good gift idea. @JoeFresh @cdngiftguide I want two dresses for the holidays: the multi stripe sweater dress and the polka dot party dress! my pick is the expedition parka. Love the Orange liner, so cheery! While I would LOVE LOVE to pick something for myself…. my boyfriend is in much need for a new winter coat to get us through the cold Saskatchewan winters! I would also like to re-pin the toddler sweater for my little grandson. I need this skirt in my closet. NOW. I adore this DEEP V-NECK SWEATER in OATMEAL $59 it’s the perfect gift! https://www.joefresh.com/ca/Categories/Kid-Girl/Outerwear/Kid-Girls%E2%80%99-Faux-Leather-Bomber-Jacket/p/KGT5OT1039_407 My daughter would look adorable in this! I love the white pocket shirt!